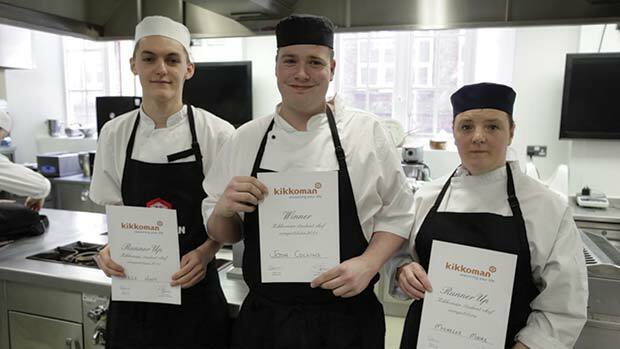 A catering student from Cambridge Regional College has been crowned the 2014 Kikkoman Student Chef of the year. Josh Collins fought off competition from 4 other finalists from colleges around the country to win the award. Students were invited to take part in the competition to create and execute the best non oriental dish using Kikkoman soy sauce as an integral ingredient. After the intense cook off it was Josh Collins who took the spoils with his dish of ‘Slow cooked salmon with Black quinoa, Kikkoman and honey crust, carrot puree, glazed carrot and burnt lemon segments’. Reece Hunt of Hopwood Hall College came in second place with his ‘Skate stuffed with Spiced crab, avocado salsa, soy dressing’. Finishing in third place was Michelle Moore from Burton & South Derbyshire College with her ‘Salted caramel, banana & chocolate tarte tatin’. The competition was judged by Simon Hulstone, Michelin starred chef of The Elephant in Torquay and Bing-yu Lee, Manager of Kikkoman UK. The judges were on the lookout for the best dish, whether starter, main or dessert to showcase the versatility of Kikkoman soy sauce in a non-oriental dish. Entries were also judged on their taste, presentation, skills and Mis en Place. It was through these criteria that the winning dish was chosen as it delivered on taste and a great use of Kikkoman Soy Sauce as a flavouring and seasoning. As well as being crowned the student chef of the year Josh will also receive a £250 equipment voucher as well as a week’s work experience with Michelin starred chef Simon Hulstone at The Elephant, Torquay. The two runners up will also receive £125 and £75 of vouchers from Kikkoman.